Concerns raised by the Ombudsman for Children in her Annual Report, over the state’s failure to properly protect vulnerable children and to support families with additional needs, must be heeded and acted on. The 43 per cent increase in demand for the services of the agency is testament to the high regard in which Ms Logan and her Office are held, but alas, also provides a clear indication that the state, through its various departments and agencies is failing to deliver on the services that children and their families deserve, and to which they are entitled. The fact that education-related complaints form the bulk of concerns raised, should be of particular concern, but it is hardly surprising given the dismal performance of Fianna Fail in making provision for children with special needs. Over a quarter of complaints handled referred to health-related matters, such as child protection, access and adequacy of HSE services, and decisions regarding children in care. We already know that social work teams are considerably under-resourced, and thanks to the HSE staff recruitment embargo, just about every one of them is operating well below full staff complement. Local child protection teams simply don’t have the resources they require to make early interventions, in order to prevent a problem in a family escalating into a crisis. 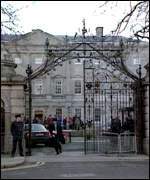 When Brian Cowen was elected as Taoiseach he told the Dail that the particular responsibility of the Govt was to “represent the interests of our young”. It’s now time for him to act on that worthy sentiment by ensuring that the concerns raised by Emily Logan are addressed and resolved immediately.